Level C is recommended for either 2nd or 3rd grade classrooms. 2: Where Does Money Come From? 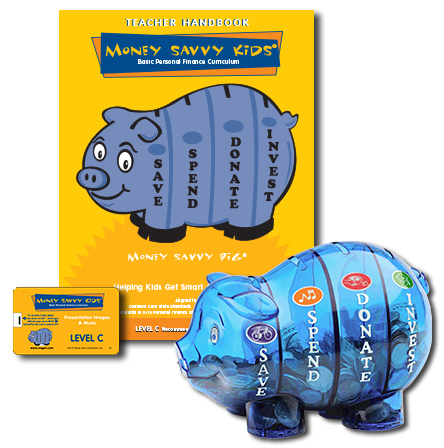 Students love working with the Money Savvy Pig piggy bank and, of course, receiving one of their very own to use in the classroom and ultimately take home. They relate to the hands-on-activities, two per lesson that simulate real life experiences and will enjoy singing along to the catchy "History of Money" song. There are also newsletters to take home to start the dialogue between parent and child. All instructional materials are included. Total teaching time required: 6 hrs. Pre-requisite: None. 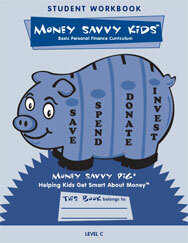 Note: The Licensing Agreement for the Money Savvy Kids curriculum requires the purchase one set of instructor materials per classroom and one student bundle (one Student Workbook and one Money Savvy Pig) per pupil. Instructor materials may be reused from year to year.